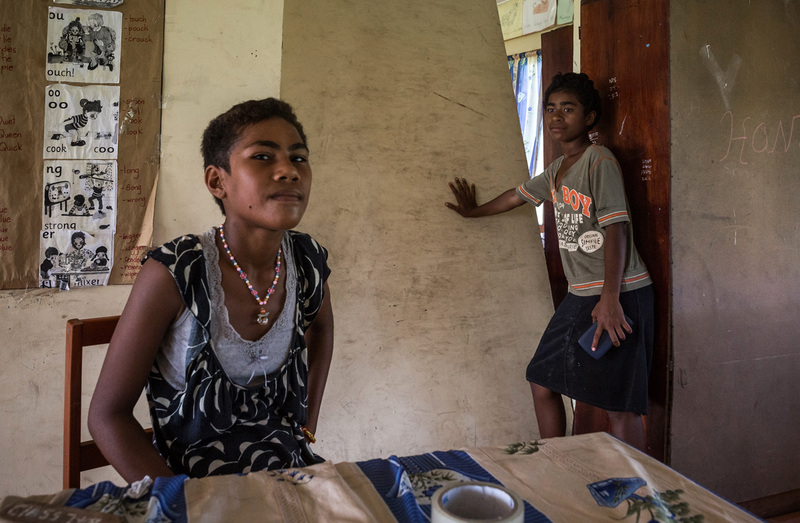 In Yaqeta village, Yasawa Islands, 39-year-old Leba sits on a mat in the place where her family house stood, before it was destroyed by Tropical Cyclone Winston. She is joined by her husband Tiloko and their five children Adi, Makereta, Emosi, Waisake and Vasemasa, aged from 16 to just one. Leba’s family lost all their food in the cyclone. They received food rations in the village hall, but even that is running out. Her daughter Adi, 13, sits beside her mother listening, and quietly adds her own experience of the night. 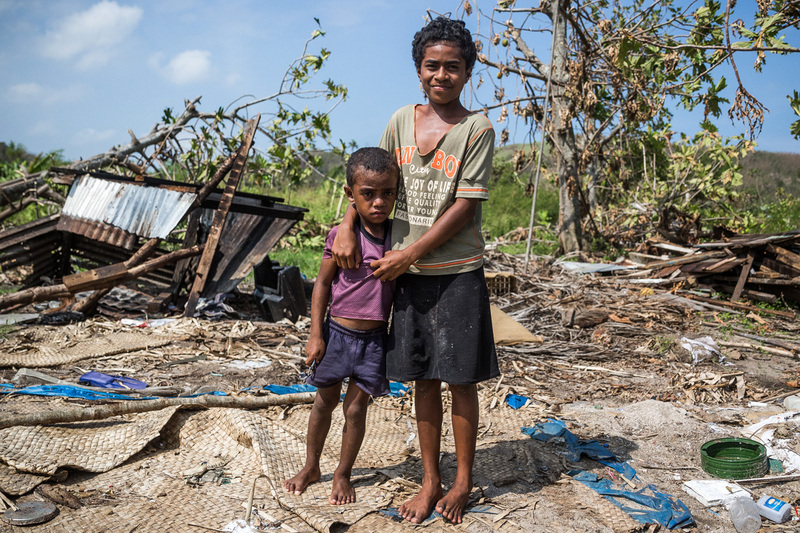 When UNICEF landed on Yaqeta, the idyllic island that was once lush with vegetation had been stripped bare by Cyclone Winston. A group of men were sitting around a large fish, sharing a meal for lunch. All the children had gathered on the veranda of a house that survived. 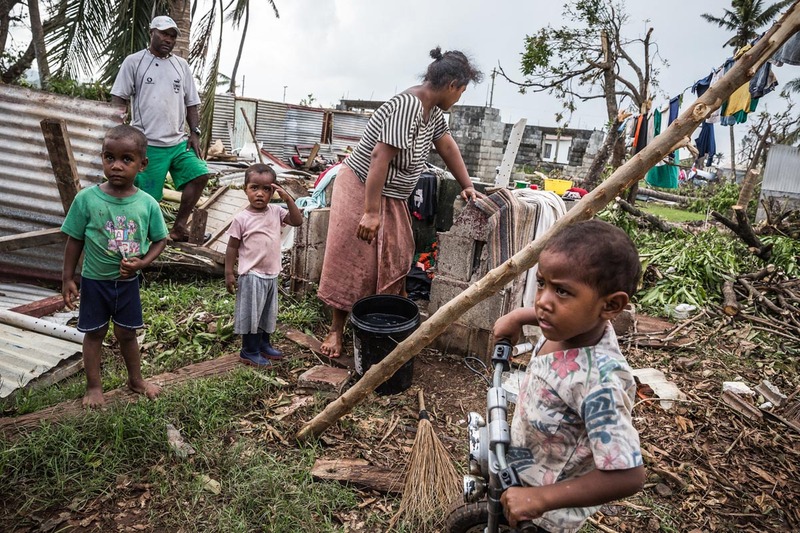 Most of the people in Yaqeta village went to sleep in their homes the night cyclone Winston was set to hit Fiji. Village Headman Moapi Seuseu said they knew there was a cyclone coming, but they didn’t know when it was going to hit them. “Food and water is what we need now, because our farms are gone,” Moapi adds. Meanwhile, in Navuavua village, Ra Province, 12-year-old Adi Laite is at home with her family. Her mother washes their muddied clothes outside in the light rain and her father clears debris with a heavily-bandaged hand. Last Saturday afternoon, the winds of Cyclone Winston swept Navuavua village in Ra, destroying 15 homes. The family watched in horror as their neighbour’s house was torn apart by the strong winds. Their own home was also being destroyed, first the kitchen, then the shower. That’s when her father Lasaro Vota knew he had to move his children fast. “I told my family to leave everything – the TV, radio, everything don’t worry about it and go,“ he says. Battling against the ferocious winds, Lasaro took the children to a neighbour’s house one-by-one. He pauses and points to the bandage on his hand and says “I got this taking my third child to safety, I lifted my hand to protect my face from a piece of flying tin roofing”. As he went to get his fourth child, it was pitch black and the area had started to flood. Lasaro was walking blind and injured himself again, slicing his foot on another piece of tin roof that was in the muddy water. 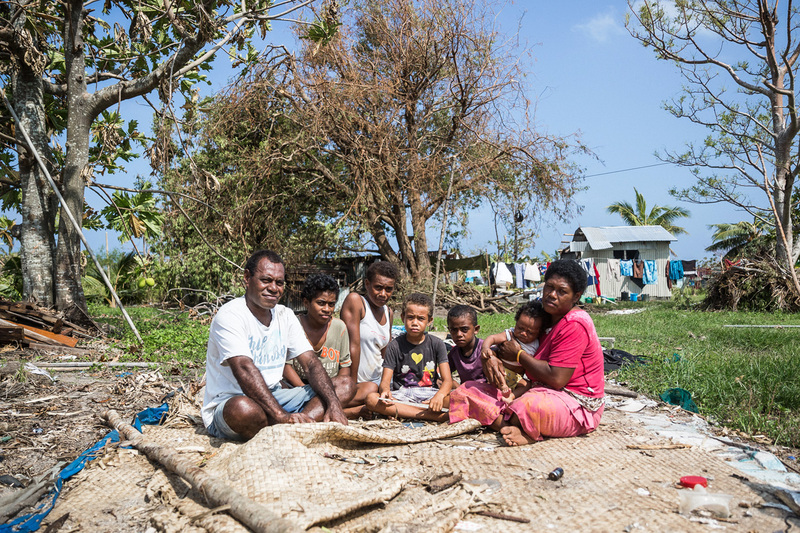 Despite his injuries, Lasaro managed to carry each of his five children through the strong gusts of wind to safety. After his family was secure, Lasaro ignored his own advice and made a final trek back to his home through the strong winds to salvage what he could. He realised his mistake when he couldn’t close the door to his home and the cyclone reached peak intensity. “I couldn’t move out of the door, the wind was so strong so I turned around, opened our deep freezer and took shelter in there” he says. 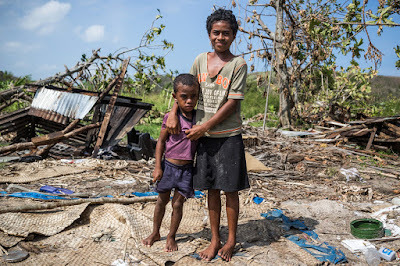 Lasaro waited until 12am when the cyclone died down to leave the relative safety of the deep freezer and seek out his family who were thankfully safe at their neighbours. Families that have lost their homes and crops in the cyclone are extremely vulnerable, with their primary food source wiped out along with their homes. UNICEF Pacific is working in partnership with the Government of Fiji to respond to the urgent needs of affected children and communities. 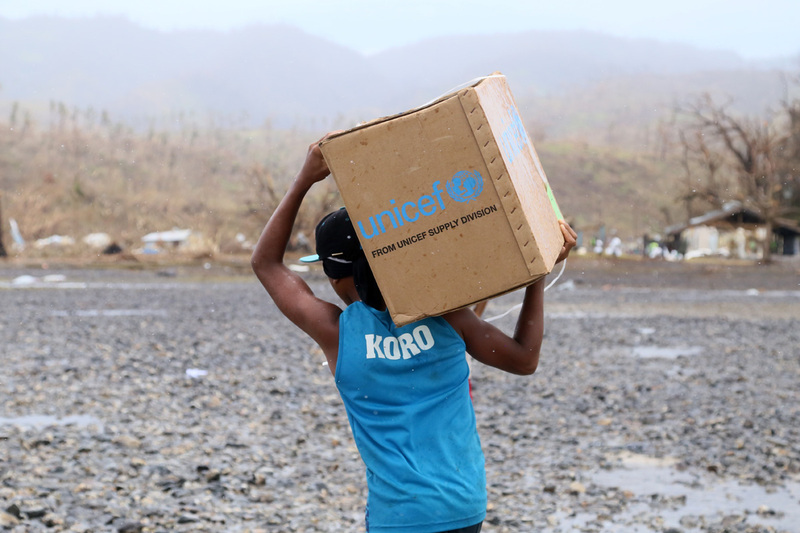 Within 36 hours of the cyclone hitting Fiji, UNICEF was distributing pre-positioned emergency supplies to those most in need.